I am organizing my best friend’s bridal shower and wanted to do something fun and creative for the event. 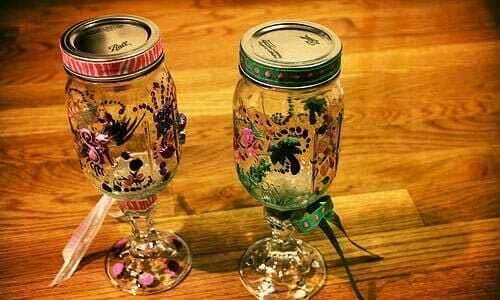 Finally after hours of thinking I came up with the idea of decorating our own wine glasses or even for the event. If you don’t want to use real glass for this craft, a plastic goblet would work great too. The best part was that the wine glass would work fantastically as a favor to take home after the shower as well. An added advantage is definitely that no more stressing of glasses getting mixed as you can easily keep track of your decorated glass for the night. Draw a figure or a character that you might what. Print different sizes of the same since you might need to do it a couple of times to get the accurate size. Tape the cut out inside the glass and trace the character out on the outside. Can’t be easier right? A great idea would be to paint the bottoms of the glass as well. Maybe you could write a message or your name and date to remember this amazing party! Once you take the glasses out, let them cool completely. Now crack open a bottle of something delicious and bubbly and have a great time with your new, one of a kind, wine glasses!